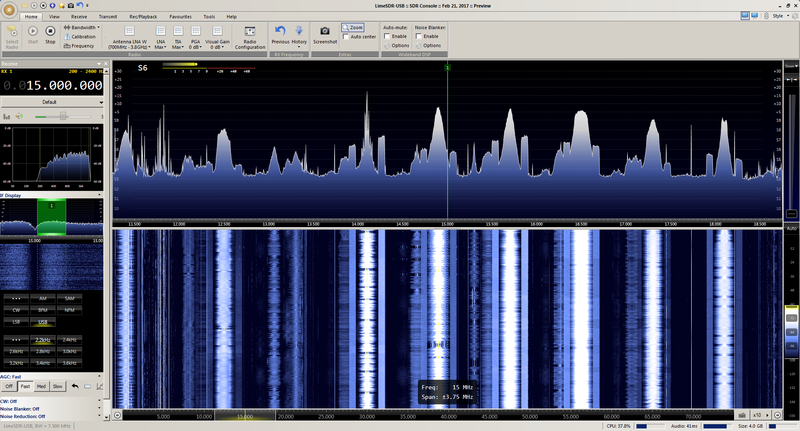 I’m here at my buddy, N9TGR’s, house testing my freshly modded SDR (for HF) and I think I’m missing something. I did the mod on the RX1_W port. The radio is amazing <12MHz, but anything from roughly 12-19MHz is…well…the first pic is of 20 meters, the second is a 7 MHz span. 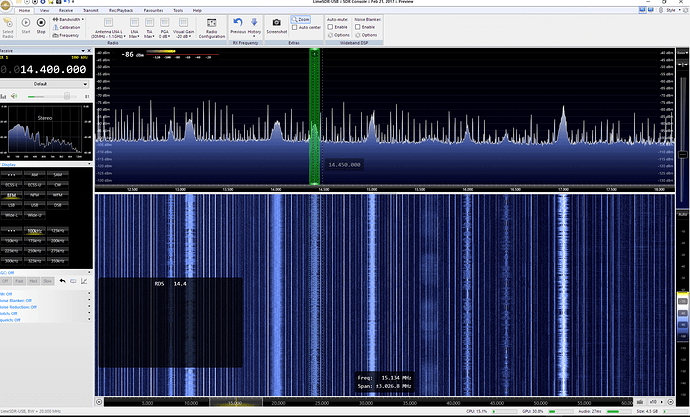 I’m listening through a 80 foot tower with a 4 el. SteppIR on it. Anyone have any clues/ideas for me? The same problem that I have. Signals mixed in by the harmonics of the oszillator. You see the 7th harmonics. Try to demodulate the signals from the second screenshot with WFM. That…ok, so that makes sense, but is there no way to stop it? or a remedy? I see the above clean spectrum. I did the same picture around 15MHz , same settings of SDR Console. 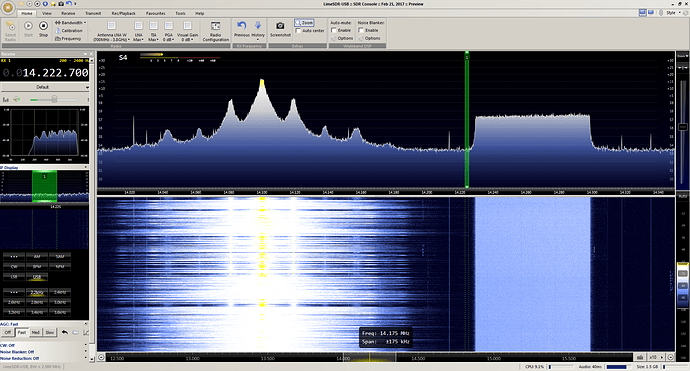 Removed inductance on RX1_L, calibrated Limesdr. Ramsin has so clean spectrum. Mine is full of spurs. I use telescopic room antenna put on my window. Why do I see those spurs? Is this because I use unappropriated antenna for this band? Is my area very tones crowded? (I am in a big city) The tones you see change their levels 3,4 dB each 2, 3 seconds but stay at the original place. So I would think those are something really available in my local ether. Its probably power supply noise or LNA gain is too high. @martywittrock I just saw a video of you testing out your Lime on 20…without the harmonics I’m experiencing. What was your secret? The LimeSDR was not capable of tuning HF mode at the time and I used an HF Upconverter module (with an embedded LPF) that I designed for the RTL-SDR and knew it would work on the LimeSDR. So I did that video to show the Lime operating in the 20m band. The LPF on my HF Upconverter kills everything above 88 MHz and only passes the HF band. Then there’s a 22dB preamp on the board, too, before it enters the mixer so the signals entering the mixer are at proper levels. The result is a clean upconversion, too. Once the LimeSDR was capable of HF tuning (about August of last year) then I have been using a Kenwood LP-30 Low Pass Filter on my LimeSDR receive input to kill the FM band and other interference and only pass the HF band. Thanks for the input, Marty. It was difficult to test sensitivity using the antenna setup that I was as basically ANY signal is massive. I’m waiting for the weather to break here in Chicagoland so I can put my wire back up. Now…on to messing with it a bit more. Easy Mode #2 results (3 capacitors installed). Same antenna/gain. different LPFs. First image with mode # 2, second with just coil removed from LNW port. Do you mean I probably have strong interference from the out band (out of 15MHz area I am observing) and I actually see their products? Or do you mean putting filter should shape the spurs on display if they come from the antenna? My board is without enclosure now and powered from laptop on its battery. Nevertheless it seems the USB cable is pretty noisy, I get displayed noise floor increasing a lot if I approach my RF cable to the USB connector. I will try external power as soon as I get suitable DC jack, anyone getting good improvement with external power? 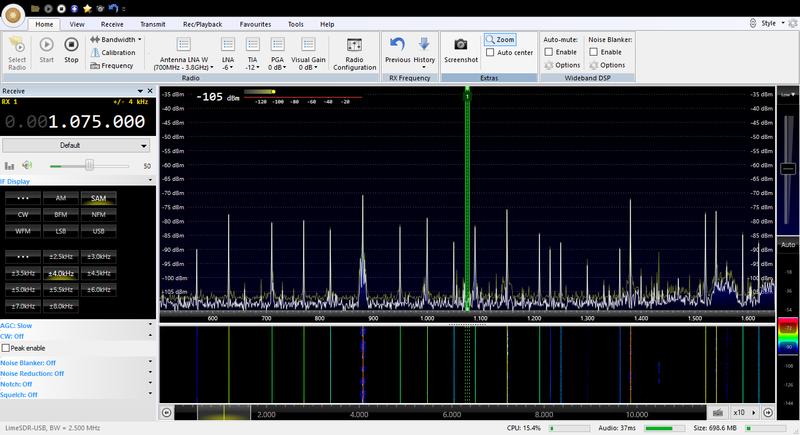 Without antenna SDR Console same settings is 20dB less noise floor and less amount 25dB smaller spurs. See attached. As we’ve been saying on numerous threads: If you are running it without front end filtering you are getting tons of noise, harmonics and mixing products from EVERY RF source in range. Your TV, computer, FM stations, fluorescent lighting, LED lighting, refrigerator, cars and motorcycles driving by outside. Get it into a shielded enclosure and use a preselector. I am new to ham receiving. Can you give me an example for a filter part number you can suggest? More general you suggest filtering of the out of band energy, right? How wide band pass filter should be. Any practical resources online you can point of? I sure can, be happy to in fact. It’s not an Alex set (no longer available) , but it does the job with reasonable amounts of in band losses, nothing I can’t make up for with a LNA4HF which can be switched in and out on the preselector board itself. Yes, out of band energy is exactly what we are talking about. Analogue rigs don’t get hit so hard because they are tuned circuits to start with. SDR is not tuned, it is direct down converted to baseband and then you explore segments of that down conversion product with the software. So the software filters come well after the front end on these which is why they don’t help with mixing products and harmonics as those just get amplified and down converted along with everything else. As we only have 12bits of data loud signals elsewhere in the band create a higher noise floor covering lower level signal up to 64MHz away from the offending source (the width of the front ends pass band). As for how wide, just as wide as the band you are interested in is the rule. This individual band slice filtering is only really an huge problem in the HF, higher up a FM trap (or two if you are parked within a kilometre of a big FM broadcasting station) and/or high pass filtering will cover you. If you are transmitting any switch-able low pass filter will do the deal. In the VHF/UHF/SHF a low pass filter near the band you are operating should be the rule, these DUC type transmitters tend to throw out a lot of harmonics (it’s not exactly a perfect sine wave on the outputs) so blocking anything within one multiple of your working frequency or higher is highly recommended or you might get the “band police” calling you names on air and reporting you to your spectrum authority. As they should. However you MUST have a license to transmit on ANY frequency other than PMR or whatever passes for that in your country. Even then some countries only allow type certified gear on PMR types bands so make absolutely sure you know the laws in your country. Fines for unlicensed transmitting are stiff everywhere and likely to make you homeless if you are a pay packet to pay packet kind of person. If you transmit on military or public service it’s worse with jail time on top of the stiff fines. The enclosure is on its way to me so I will check if and what difference it will bring. Also the power plug so I can test external power. I will try pre-selector as an extra step after that. All this sounds as a good learning curve? BTW are all software radios equally susceptible to an out of tuning band disturbers? 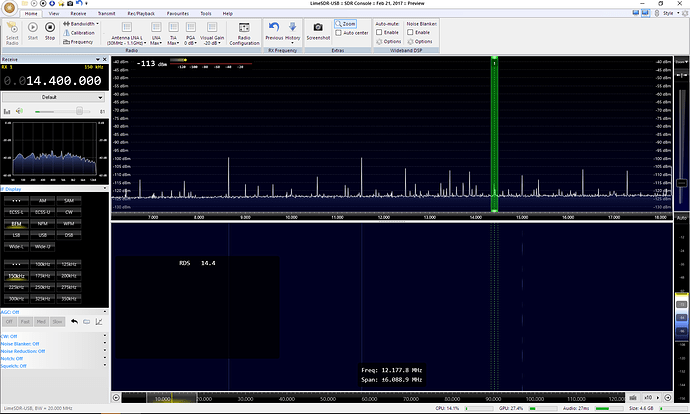 Well with the caveat that the commercial SDR’s already have the filtering and LNA’s we are talking about which is why we see so many HackRF and similar users here complaining about the noise floor/lack of weak signals/FM images when compared to their HackRF/whatever. Do you mean I probably have strong interference from the out band (out of 15MHz area I am observing) and I actually see their products? Or do you mean putting filter should shape the spurs on display if they come from the antenna? Its hard to say … but yes … having a shielded case for the LimeSDR and bandpass filter for the region of frequency’s you want to observe will improve things … Clean power is also a good practice. Without filtering of the power, Rf input and body of the LimeSDR, it is hard to quantify what is shown in the display as bad or good result. kc7noa hit one that I didn’t cover there, a shielded case.